Scott Carroll has been dedicated to the teaching profession for over twenty years. He has a dual degree in Secondary Education and Spanish Philology from SUNY Potsdam. He taught Spanish in high school in New York State, and later studied for a Master’s Degree in Spanish and Latin American Literature in New York University in Madrid. While studying, he also participated in a number of choruses and theatre groups. 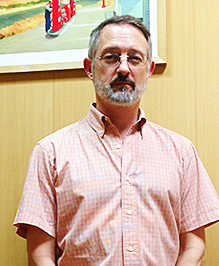 Scott began teaching English in Madrid in 1990. Since then, he has taught to adults and children, from Business English students to beginners. From 1995 to 1997 he worked for Princeton Review in Madrid and has since dedicated many years preparing students for university entrance exams. In the intervening years, he has been an Academic Director, Head of Studies, and Master Trainer for test preparation, often simultaneously. Every student has a particular way of learning, and Scott feels that it is his task and his strength to find the best way to educate each individual. With more than ten years of experience in academic consulting for MBA students, Candy Lee LaBalle has helped over 200 students get into top MBA programs and she is an expert in her field. She also organizes TOEFL training courses. Sue Magan has been helping students into study abroad programs, undergraduate universities, and Masters Programs for twenty years. She is highly professional and is a pleasure to work with, as are the members of her team. Kevin Armstrong prepares hundreds of GMAT students each year. He knows the exam intimately, is an expert in math, and has inexhaustible patience (and resources). If your goal is a 700+ GMAT score, Kevin is the teacher for you.